Over the years, the transcontinental gifting elf Kris Kringle a.k.a. Santa Claus has gotten an intimate peek at all of our homes, but we’ve all been left to wonder what his North Pole abode really looks like. Well, lucky for us, Old Saint Nick decided to give Zillow an exclusive “peek” at his 25-acre estate, which is said to include a three-bedroom, two-bathroom main house for him and Mrs. Claus, and an elf village with three tiny houses that would make any HGTV addict green with envy. 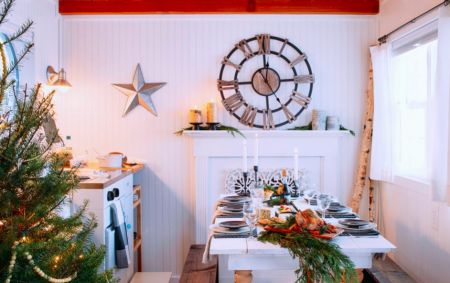 Zillow first put together the imagined look at the property in 2016 for the Christmas season, hoping to give parents and kids a fun new way to celebrate. 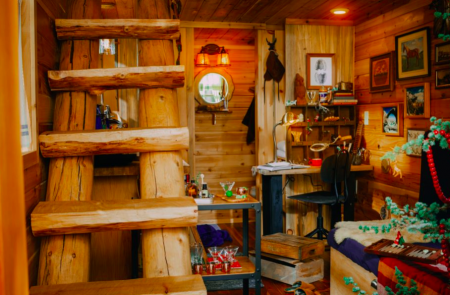 The 196-year-old main cabin went through a major renovation in 2013 and perfectly reflects the Clauses’ appreciation for Old World style with a modern touch. Maybe that’s why, despite its remote location, it is now worth over three quarters of a million dollars: a cool $764,389, up from $705,000 this time last year, according to the Zestimate (but as Zillow says in its disclaimer, this is just a “starting point to determine a home’s value”). The Claus’s living room and gourmet kitchen. The living room has a floor-to-ceiling fireplace, which is the perfect backdrop for a holiday celebration or a quiet night alone after delivering gifts. To the left of the living room is a gourmet kitchen decked out with an oven that has twelve cookie settings and a tap that keeps the hot cocoa flowing all day long. The master bedroom and two guest bedrooms are artfully decorated with holly and eye-catching plaid prints, and Santa’s private study has a pristine view of the North Pole’s forests. 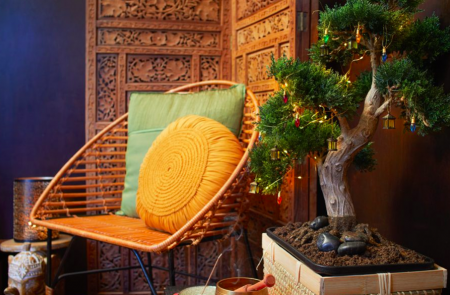 Just a sleigh’s ride away is Elf Village, where Santa’s dutiful helpers have three, distinct tiny homes to choose from — a farmhouse perfect for a Christmas Day celebration, a mini cabin stocked with sweet treats after a long day making toys, and a Chinese-inspired bungalow that offers ultimate relaxation. Unfortunately, Santa didn’t allow any photos or videos of the toy workshop since his team is in a mad dash to fulfill gift orders before Christmas Eve.